25 The grace of our Lord Iesus Christ be with your spirit. Amen.Written from Rome to Philemon, by Onesimus a seruant. 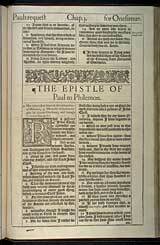 Philemon was an inhabitant of Colosse, a person of some note and wealth, and a convert under the ministry of St. Paul. Onesimus was the slave of Philemon: having run away from his master, he went to Rome, where he was converted to the Christian faith, by the word as set forth by Paul, who kept him till his conduct proved the truth and sincerity of his conversion. He wished to repair the injury he had done to his master, but fearing the punishment his offence deserved might be inflicted, he entreated the apostle to write to Philemon. And St. Paul seems no where to reason more beautifully, or to entreat more forcibly, than in this epistle.The apostle's joy and praise for Philemon's steady faith in the Lord Jesus, and love to all the saints. (1-7) He recommends Onesimus as one who would make rich amends for the misconduct of which he had been guilty; and on behalf of whom the apostle promises to make up any loss Philemon had sustained. (8-22) Salutations and a blessing. (23-25)1-7 Faith in Christ, and love to him, should unite saints more closely than any outward relation can unite the people of the world. Paul in his private prayers was particular in remembering his friends. We must remember Christian friends much and often, as their cases may need, bearing them in our thoughts, and upon our hearts, before our God. Different sentiments and ways in what is not essential, must not make difference of affection, as to the truth. He inquired concerning his friends, as to the truth, growth, and fruitfulness of their graces, their faith in Christ, and love to him, and to all the saints. The good which Philemon did, was matter of joy and comfort to him and others, who therefore desired that he would continue and abound in good fruits, more and more, to God's honour. 8-14 It does not lower any one to condescend, and sometimes even to beseech, where, in strictness of right, we might command: the apostle argues from love, rather than authority, in behalf of one converted through his means; and this was Onesimus. In allusion to that name, which signifies "profitable," the apostle allows that in time past he had been unprofitable to Philemon, but hastens to mention the change by which he had become profitable. Unholy persons are unprofitable; they answer not the great end of their being. But what happy changes conversion makes! of evil, good; of unprofitable, useful. Religious servants are treasures in a family. Such will make conscience of their time and trusts, and manage all they can for the best. No prospect of usefulness should lead any to neglect their obligations, or to fail in obedience to superiors. One great evidence of true repentance consists in returning to practise the duties which have been neglected. In his unconverted state, Onesimus had withdrawn, to his master's injury; but now he had seen his sin and repented, he was willing and desirous to return to his duty. Little do men know for what purposes the Lord leaves some to change their situations, or engage in undertakings, perhaps from evil motives. Had not the Lord overruled some of our ungodly projects, we may reflect upon cases, in which our destruction must have been sure. 15-22 When we speak of the nature of any sin or offence against God, the evil of it is not to be lessened; but in a penitent sinner, as God covers it, so must we. Such changed characters often become a blessing to all among whom they reside. Christianity does not do away our duties to others, but directs to the right doing of them. True penitents will be open in owning their faults, as doubtless Onesimus had been to Paul, upon his being awakened and brought to repentance; especially in cases of injury done to others. The communion of saints does not destroy distinction of property. This passage is an instance of that being imputed to one, which is contracted by another; and of one becoming answerable for another, by a voluntary engagement, that he might be freed from the punishment due to his crimes, according to the doctrine that Christ of his own will bore the punishment of our sins, that we might receive the reward of his righteousness. Philemon was Paul's son in the faith, yet he entreated him as a brother. Onesimus was a poor slave, yet Paul besought for him as if seeking some great thing for himself. Christians should do what may give joy to the hearts of one another. From the world they expect trouble; they should find comfort and joy in one another. When any of our mercies are taken away, our trust and hope must be in God. We must diligently use the means, and if no other should be at hand, abound in prayer. Yet, though prayer prevails, it does not merit the things obtained. And if Christians do not meet on earth, still the grace of the Lord Jesus will be with their spirits, and they will soon meet before the throne to join for ever in admiring the riches of redeeming love. The example of Onesimus may encourage the vilest sinners to return to God, but it is shamefully prevented, if any are made bold thereby to persist in evil courses. Are not many taken away in their sins, while others become more hardened? Resist not present convictions, lest they return no more. 23-25 Never have believers found more enjoyment of God, than when suffering together for him. Grace is the best wish for ourselves and others; with this the apostle begins and ends. All grace is from Christ; he purchased, and he bestows it. What need we more to make us happy, than to have the grace of our Lord Jesus Christ with our spirit? Let us do that now, which we should do at the last breath. Then men are ready to renounce the world, and to prefer the least portion of grace and faith before a kingdom. Phyllis Engebretson, The claim that Philemon, his wife, son and Onesiums were martyred is an unsubstantiated story, or "tradition," that Christian historians have disregarded because there is no evidence for it. I hope this answers your question. Blessings! I am always moved by one individual acting by faith on behalf of another. Phyllis; The Father knows every name of every single one of His children whose souls are under the Golden Altar before His Throne. "Why we are afraid." It is an important part of Church History that we should really know, and describes a fulfillment of the Prophecy John wrote to us; and is one of the seven heads of the dragon. I have a question. Was Philemon, along with his wife, son, and Onesimus martyred by Androcles, governor in days of Nero?